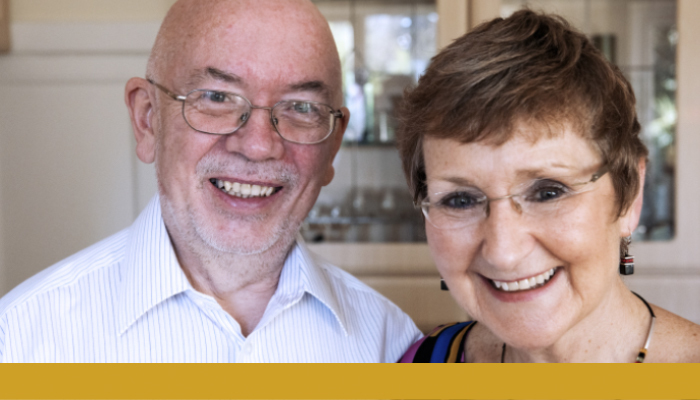 Jim and Mary: Why we were inspired to leave a gift in our Will for RNIB. We have been supporters of RNIB for years. We had reason to use their services when our daughter was left without sight in one eye following a brain aneurism. Thankfully, she has now recovered her sight. Following our attendance at one of their legacy receptions, where we heard more about RNIB’s services for blind and partially sighted people, we were inspired to leave a gift in our Will. We don’t feel we are the ones being generous by leaving a legacy; it’s RNIB who are generous because they give so much to society through the work they do. The least people like us can do is say ‘thank you’. We’ve never thought of it like that until this moment – we are not the givers, we are the receivers. RNIB are the people who give. Find out how you can leave a gift in your Will for us.